The vast shopping centre is something we’re all used to, but it’s not where you’d go if you wanted to buy a horse. In the early years of the 19th century, it is exactly where you would have gone, particularly if you’d wanted to mix with the fashionable. 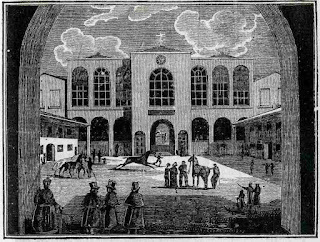 I must admit that before this week, I’d not given a great deal of thought to how horses were bought and sold in the nineteenth century, but I was asked if I knew about a riding school that had once existed in King Street, off Baker Street in London. I didn’t, but I investigated. I found that there had been a riding school which occupied the former King Street Barracks, established in 1822. And it was far, far more than a riding school. Whatever your equine need, the Horse Bazaar could meet it: horses, carriages, equipment – it was all there.